Time to order or reorder Cheques for AgExpert Analyst? 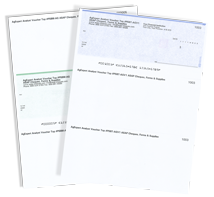 We offer all styles of AgExpert Analyst Cheques - Voucher Cheque On Top and Voucher Cheque in Middle. Our AgExpert Analyst Cheques are compatible with all Ink/Inkjet and Laser Printers. Most orders are ready to ship in just 1 day! Our AgExpert Analyst Cheques are guaranteed to be compatible or you get a 100% refund - click here to learn more about our No Hassle Guarantee. We use a premium quality cheque paper that won't jam in your printer like thin, cheap cheques will. AgExpert Analyst Cheques from ASAP Cheques include extensive security features. We have everything you need to use with your AgExpert Analyst compatible Voucher Cheques, including Deposit Slips, Window Envelopes, Endorsement Stamps, and more. I tried your product based on the recommendation of a co-worker. We were both tired of the cost and poor quality of the cheques provided by our bank. I have been very happy with the quality of your product and the quick turn around of the orders. Great quality cheques, simple ordering process, reasonable prices.